Hello, I have just purchased your iBook 'Essential Music Theory Volume 1', I am enjoying the style and quality of the work, unfortunately though, none of the sound snippets are working at all, obviously I have checked all of my computer settings and the sound is working on anything else I play and want to listen to, has this occurred before, for any other people? Hi there, based on the very helpful guidance on intervals on this website; yesterday I purchased you book. However I was surprised to find that the book doesn’t seem to cover the subject to the same level of detail, let alone provide additional informa Ion on the subject, which is what I was expecting. Please could you clarify the purpose of the book, and let me know why there’s less content in it than on this free site. I’m very sorry to hear that! I haven’t had other reports of this happening but it is clearly to do with the book file, not your set up. I will download a copy and check it. Could you let me know which version of Mac OS or iOS you are using please? 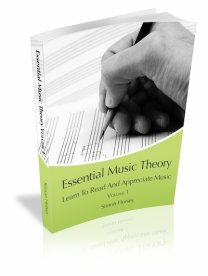 You can email me directly, simon (at) essential-music-theory.com or post a reply here.